Are you struggling with knowing who to vote for? Look no further. I've got the answer for you. It is time we had a leader who can make a difference and who cares about our children's future. 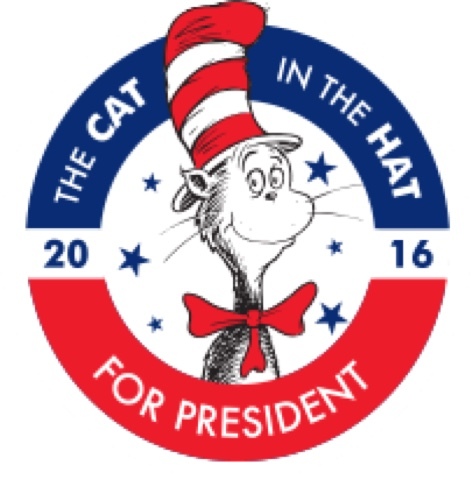 I suggest to you, The Cat in the Hat for President in 2016. Yes, I really am undecided this year due to not having a strong lead candidate. 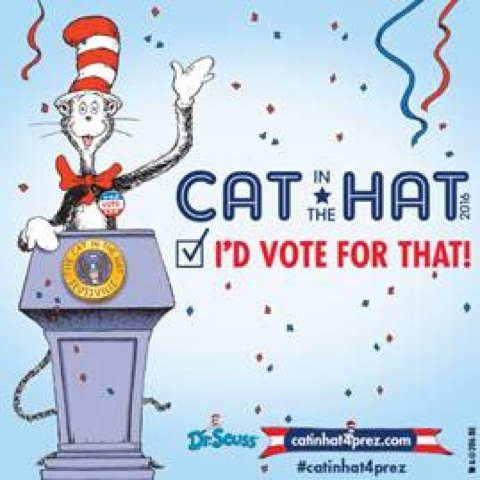 We won't be debating actual candidates here or in the comments, but I think the campaign Dr. Seuss Enterprises is running is brilliant. 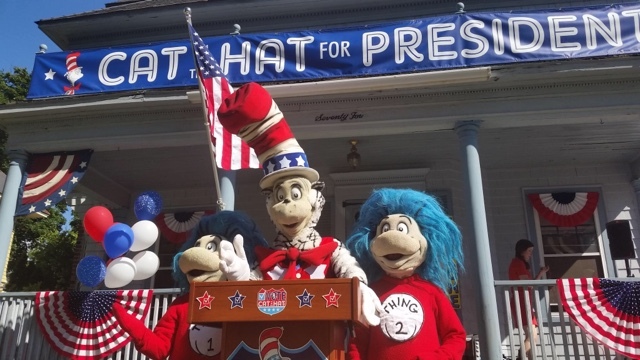 Head over to the Cat in the Hat for President Campaign Headquarters and you can vote for your favorite cause to receive a $10,000 donation. Isn't that a great idea? You can choose to support Education, Ocean Conservation, Environment, Fighting Hunger and Kindness. Easy as two clicks. Fighting hunger is leading as of when I voted. Share the link with your friends and encourage them to vote too. I found this book at our school book fair a few weeks ago. 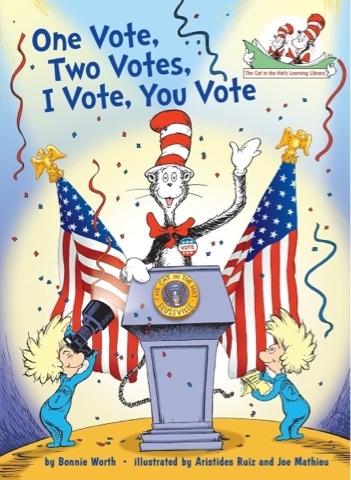 It is a great introduction to the election process put in Dr. Seuss style rhyme and easy for younger children to understand. This is a perfect book to read with your child then follow-up with a discussion on their age level about the current election and explain to them who you plan to vote for and why. Doing that actually made me think harder about the current candidates and who I would feel good about telling my kids I'm supporting. It made me think about which candidate would make the best impact on our future for my children's lives. My kids had some great comments and told me things they had heard at school too (some nice and some not so nice - other students are listening to their parents and learning a lot). As we discuss politics we should be aware of listening ears and let it be a teaching moment for our children. I used to take my children with me to the voting polls but now with mail-in ballots I showed them my ballot to let them see we are voting for more than just president this year. We watched a little bit of a debate together but I decided it was not appropriate for my kids to continue watching. I read through the transcripts the next day on my own then told them about certain topics. My 5th grader is learning about the voting process, electoral college and branches of the government at school this year and will have a mock opportunity to vote. It would be fun to have your own mock election at home and make slips of paper for each person with the names of the candidates and have them vote then tally the votes to see if there is a consensus or tie. Dr. Seuss Enterprises held a press conference at Dr. Seuss' childhood home to release their new book. 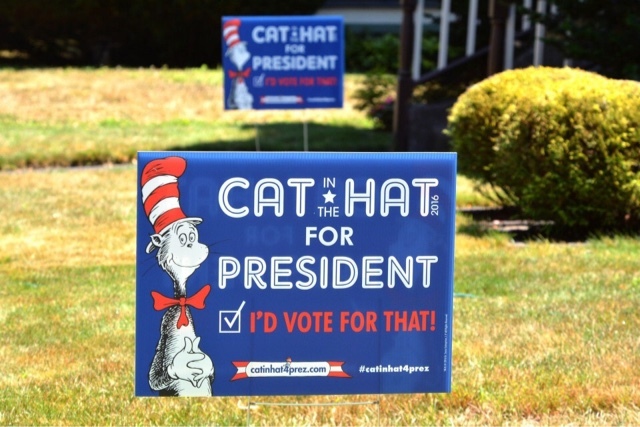 I really want one of these yard signs. Now click over Dr. Seuss to VOTE! for your favorite cause now.